Showing results for tags 'Bar'. Previously: Chapter 1 Dramatis Personae: It was not a normal day in the Blue Lantern pub. With the absence of Captains Li and Cho Fang as well as Captain Fheng there was a power void among the pirates that frequented Rassilon. Captain Sulu, captain of the Golden Dragon was already famous for capturing many prizes. A number of the other captains were leaning towards making him their leader. Captain Sulu Captain Ching Shih had sailed for Li Fang for many months taking control of La Oleon when she was first captured and then The Viper after Li Fang died. Quite a few captains favored Shih. Captain Shih The pub had not been closed to local traffic, but most citizens knew better than to try to enter while the captains were vying for power. So when Sinbad strolled in it was met with some surprise. Everyone turned to watch him as he bought a drink and then raised it for a toast. "To the pirate captains!" he shouted. No one raised their glass. Sinbad just cocked an eyebrow and took a swig. "You may be wondering why I'm here," Sinbad asked. "Well, it's to make a business proposition." Just then another man walked into the pub. There was a gasp heard throughout the room. At first glance it had seemed that Captain Fheng was back from the dead. The man held an uncanny resemblance to the former captain. He said, "Whatever this scum has to offer you can wait. I am Captain Fheng's son, Francis Fheng and I have come to claim the right of Pirate Lord among you. Many of you sailed under my father's colors, now I've come to ask you to sail under mine. My father wanted to show the 'civilized' world how wrong they are for trying to tax and enslave us. We were meant to live as free men and I intend to sail against anyone who says otherwise. Who's with me!?!" As Francis was finishing his rousing speech Sinbad walked up to him and said: "Excuse me, I don't like being called scum." "You, you sailed with my father. Yet you weren't there when he died. That makes you scum and not worth my time." "Well you better make time. You see, it doesn't benefit me if everyone here sails under your colors. So I'm going to give you a choice." Sinbad pulled out a coin. "What are you getting on about?" "It's simple. We are all here by our own choice. I'm not making you stay or go. That's your choice. But I'm telling you that you better choose to leave." "Son, you're crazy! Get out of my way." Sinbad pulled out a pistol and everyone gasped. "Alright, if you won't make the choice. I'll make it for you. I'm going to flip this coin. If it lands as heads, I'll let you leave alive. If it lands tails you'll be leaving to go meet Davy Jones." Before anyone could react Sinbad had thrown the coin in the air. He caught it and looked at it. "Heads. You're lucky day." Francis Fheng turned and fled the pub. Sinbad turned to address the captains. "As I was saying before. I have a business proposition for you all." He walked back to the bag he had left and the counter and took it to one of the tables. All the pirates gathered around him, their former vying for power forgotten. "All of you sailed under Captain Fheng before his untimely death. As you know, he died fighting for what he believed in. That was his choice. I'm asking you to elect me as your Pirate Lord and to sail for something even better than beliefs." "And what's that?" shouted one of the captains. "Gold. There's lot more where this came from. I have it stored in safe location for now, but Freddy can validate my wealthy. He helped me bring it back for the forsaken island we found it on. Make me captain of the Priest's Bounty and elect me as your leader and I promise to make you all rich beyond your wildest dreams!" It was a unanimousmus vote. Sinbad was now Pirate Lord of all pirate captains in Rassilon. Hi everyone, I am always looking to broaden my range of Architecture styles that I try my hand at, so this time its mid-century modern. This was a good way of incorporating some interior ideas I had without building a huge exterior building to house it. I've went with a understated colour palette, and simple but varied textures which are found in many a lobby of civic buildings built around this time. A few features such as the large simple wallclock, sloping windows and planters were all a common site in all the reference material I could find. The bar overhang(er) was a personal touch. It's another bar but this time within an Airport lounge. Anyway on with the pics, 5 in all; You can view them on my flickr stream here if you prefer: https://www.flickr.c...s/52656812@N04/ Comments welcome! Bon voyage! Hello star wars lego people. Proxy here, first post. I've been collecting the star wars sets for a couple years now. I have a bad habit of buy two of each set to see if I can combine them into an improved version of the set. My latest run was at the Mos Eisely Cantina. Using two Cantina sets, along with some left over parts from my advanced Jabba's Palace, I made the follow improvements. I'm not 100% complete and satisfied with it yet, but its a good start. I wanted to keep the same feel as the original set, and not build something insanely accurate to the movies. I feel this still holds onto the heart of a lego set. Exterior Front entrance with Stormtrooper patrol 20140823_153120 by artisanproxy, on Flickr Stormtrooper patrol 20140823_153135 by artisanproxy, on Flickr Front view of the Cantina's side 20140823_153323 by artisanproxy, on Flickr Rear view of the Cantina's Side 20140823_153306 by artisanproxy, on Flickr Rear entrance 20140823_153254 by artisanproxy, on Flickr Interior Set still folds open as originally designed 20140823_153426 by artisanproxy, on Flickr Improved bar 20140823_153646 by artisanproxy, on Flickr I used the face from the Rancor handler for the bartender 20140823_153623 by artisanproxy, on Flickr Background characters on new wall (Bossk is totally getting a lap dance) 20140823_153557 by artisanproxy, on Flickr The band has been filled out to 20140823_153542 by artisanproxy, on Flickr Wall Tops Removed The side wall ceilings are removable for playability 20140823_153755 by artisanproxy, on Flickr Side view with ceilings removed 20140823_153811 by artisanproxy, on Flickr Top down view 20140823_153747 by artisanproxy, on Flickr I have advanced versions of some other sets I can post as well. Hello everyone This is my fifth modular building. Well, to be fair, it's more a modification than it is my own creation. My husband bought the instructions for the Apple Store a while ago and enjoyed building it a lot. But since we are not that much into Apple he asked me to replace the store by his favourite brand. I liked the original building but I always thought that it's not quite the right scale and doesn't really fit together with the other modular buildings. So I took the elements that I like (which are the colours, the facade of the ground floor and the layout of the smaller window) and created my own version. There's now a Microsoft store on the ground floor with real sliding doors. The interior is mainly based on the original one, only adjusted to the different corporate design. On the first and second floor there are apartments of a comic-strip artist and a musician. The highlight is the cocktail bar on the roof terrace which is considered an insider's tip among Bricktown. I hope you like. Any comments are welcome. Previously I made a MOC modular building, a bank, which has a piece of land on its side waiting for construction. It was to be a restaurant and finally it is done! It is not a big one as it only takes half of the 32x32 plate, but it contains what all the Lego citizens' needs for food! This building is a break from the typical European style that prevails in the original Lego modular building sets. I think a city should be developing, advancing, and things change including building styles. I tried some new elements here, with a more open façade (basically removing the façade for balconies and setting back the entrance), while taking a cleaner approach on detailing. Quick overview with the bank on its side: Let's go inside now! The entrance on the G/F floor is set back a little for a bar area. This is where people gather at night especially on Fridays! I also try sliding doors for the entrance :) At the entrance, you will see a little fridge next to a green counter. On the other side is a cake rack. In the morning, there will be breads for those who want to grab a quick breakfast. 1/F is a restaurant. Utensils are stored neatly. Someone is celebrating her birthday with friends! Well that's a huge cake! The other half of 1/F is a balcony area for semi-open dining experience. Looks like someone is not pleased when serving a rich man... "Hey that's not the tips I am hoping for..." The top floor is also a restaurant area, with an open grill kitchen. Look at the hood! Now an overview with some of my modular buildings, which are easy to recognize. The building style is a little different but still, to me, harmonious with the others. Hope you all like this creation! Let me know if you have any comment on how I can improve this! Hi! The life in big cities is impossible without snack bars. We can find them everywhere! They mean the only one choice for the running and hurrying people to get some food and drink quickly during that very short period of the day when they have a break. Well, this kind of foods and drinks are not the best for our health. Fortunately not every snack bar is bad. For example in my version if someone wants to eat something healthy and delicious, he or she can find it in the menu! Hope you find your favourite food here, and you leave a nice feedback in the visitors’ book! My favourite is the microwave oven and the hamburger tower! „The pizza is ready!” „The fish is ready!” „The chicken is ready!” „The two hamburgers are ready!” ’The hrr krhhh…. The loudspeaker is absolutely necessary. I’m sure, that the employee would get a massive sore throat at the beginning of the day without it! Someone pays, the lady puts the order into the computer, it appears on the central screen, the chef and the other workers look at it and they know what the next order is. The back is very lifelike, too! Empty bins and boxes, air-conditioner, vent hood, big and small trashes and a dog, who hopes to find something… and a lot of insects because of the food. The building has some interesting building techniques. I’m proud of the windows, they are doors after a rotation by 90°. I like it that the white frames are 3D, they leave the plane of the wall. The picture shows, what I put behind the tiles around the window. Look at the windowsills, too. I used offset plates under 2x2 tiles, 1x2 tiles can solve it without that plates. 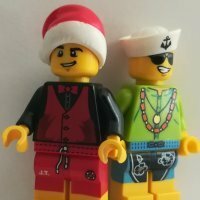 More pictures on Mocpages! Thanks for watching! :) Enjoy your meal! My newest modular is a small hotel with a New Orleans French Quarter look. The first floor: Three rooms on the 2nd floor with a shared bath: The top floor apartment belongs to the owner - Mr. Good & Evil. His secret lab is accessed through the bookcase. And the back... Comments and ideas are welcome! Thanks for looking. This MOC started life as a 16-wide Bar (from Brickcitydepot's excellent plans), then morphed into a 32-wide, then got reworked into a corner lot, then got re-skinned with a couple of Sponge Bob sets and finally it looks like this... A three story fun-palace of adult beverages and top tunes! The ground floor has some ultra-cool non-linear walls and a submarine door as an exit. The awnings are from a 9V Railway crossing set from the 90's. And beware of the wall octopus when you're using the payphone! The top floor has a roof top Bar Back to the ground floor - with it's detachable front! "We're OK as long as he doesn't play Public Image Limited's Flower's of Romance.... again" There's a very strict door policy... "It says here No sporting clebs, No men in wife-beater T shirts and No backpackers. I'm sorry gentlemen, but you can't come in" But the party is in full swing on the top floor! "Oi! That stupid cephalopod stole my drink!" The SNOT headphones are held together with a couple of.. Anyway I hope you enjoy it and criticisms, comments and ridicule most welcome! Hi everyone! I'd like to present my latest modular building, a pub / nightclub called Trilogy. The name comes from the three levels, with three different themes - bar on the ground floor, dancing on the first floor and lounge on the top floor. Bar on the ground floor: The dance floor with live DJ on the first floor: The lounge on the top floor: More images on Flickr. Thanks for looking! C&C always welcome. Gregory: Welcome back Jordan, it's been a long time Jordan: Yes it has, but now i am back for good. My second attempt to build something Castle themed. I think this one was better then my last. And here it is... Finally! I have the joy and honour to present you my last work. The legendary Route 66 connecting Chocago and Los Angeles, traversing wild deserts of Arizona. I tried to include everything that makes the US American - a bar, gas station, typical truck and Harley motorcyclits. Okay, enough words. Let's watch the pics: Some more photos will come as soon as Brickshelf staff removes all the naked women pics out of my gallery. And just as a fun-fact. It's actually the biggest MOC so far and te first attempt to build cars. So now I can finally get to do something else... Yay! Have a nice journey! As I mentioned in my post about the GN S2 MOC, I have slipped one step further down the Lego purity slope and made my own ladders. (click on the image or here to see the full gallery) You can see examples of the short ladders clipped on at the front of the tender and the long ladders clipped on at the back of the tender. If you look closely at the ladders on the front of the tender, you will see that the surface is matte (they will not be mistaken for shiny bricks), but some of the lego bars have a similar matte surface. The spacing between rungs is similar to the lego bars, but I've made the holes square instead of rectangular. Probably not something a minifig would want to put their foot in. I think the dimensions look a lot better for my rolling stock and it is definitely a heck of a lot easier than trying to do a brick built version. This past week I've retrofitted one of my earliest MOCs with the new ladder- original in back and new in front. Click on the image to see more, including the smaller ladder on the other end of the car. I like the proportions a lot better. After doing this change, I see a lot of other tweaks that I will do to the boxcar, e.g., using grilled cheese bricks for the running boards leading to the ladder, removing the buffers You can see photos of all four sizes that I've fabricated so far here. And for those of you who want to be tempted down the purity slope, you can do so here. Enjoy! While visiting one of my favorite haunts in my hometown of Atlanta, Georgia a couple of months ago, I asked myself, "why don't you MOC this?" After all, it's a smallish corner building, and it has some very unique and iconic design elements. So, I decided to give it a whirl. And within a matter of hours, I already had a basic outline of what I was doing. Here's a picture of the real thing, the Vortex Bar & Grill in Little Five Points: I knew the skull facade was going to be the make-or-break part of the MOC, so I decided to work on that first. And it took a few rounds of trial and error before I found something I liked. I did have to take some liberties to make it work in brick and keep it recognizable, but overall, I found myself happy with the build. So, here's some shots of the outside: Little Five Points was originally built as the commercial district of the Inman Park and Candler Park neighborhoods in the Eastern part of Atlanta. In the last few decades, it has become a center for bohemian lifestyles and subcultures. The neighborhood is filled with music stores, head shops, alternative fashion boutiques, and a variety of restaurants and bars. The Vortex's unique entryway makes it instantly recognizable in the heart of the neighborhood. Here are some of the folks you might be likely to see standing outside on a nice Spring afternoon: While the exterior was going to be an important thing to get right, the interior was another level altogether. The Vortex is filled with chotchkies, bric-a-brac, trinkets, and what-have-you, and there are some definite design elements that couldn't be passed over, even when scaling the building down to fit the Modular standard. The bar area, seen above, lifts out so that you can see the details behind the bar. The light brick which illuminated the bottles is activated by a button below the vent hood on the outside of the bar. Here is an exploded view of the whole building: And here's your cast and crew, thanking you for stopping by to look at my pics: You can find more pics of my creation in my Brickshelf or Flickr pages. All, I decided to tear down my 4554 Metro Station from the 1990's and rebuild it into something in a more Modular theme. So I combined it with glass from my Greenhouse http://www.eurobricks.com/forum/index.php?showtopic=76636 , a bunch of 2 x 2 tiles and some odd bits and pieces and came up with the Metro Station Bar. It was 13F/-11C outside so some of the pictures were a bit rushed. Anyway, I tried to reuse as much of the old set as possible throughout. So the greebling at the top looks like the detail work from the original, the Arrival board became the Bar's Sign. On the ground floor a red cupboard from the original became an ice chest, a Train Decorative side (#2871) became the header over the Bar. There's also the Station's clock on the wall and the original Station Chef has been rehired! Here's a shot with the stairs removed. You'll notice that the Metro Station Bar serves both kinds of wine (and it looks like it comes from an industrial source rather than a vineyard ) The rooftop terrace had the umbrella's up, but you couldn't see the detail so here's a shot of that. I reused the benches from the original. The hatchway on hinges leads downstairs. I believe that with the exception of the 2x2 tiles and the glassfront that the two story version is probably 90% original. Then I decided to add an additional floor. And this new floor's interior contains a couple of sofas, a low table and the Coffee Percolator from the original. (That Carpet colour is bright!) Finally, here's a shot from the rear. It's still very, very yellow, but I had a lot of fun transforming it from the original station! Thanks for reading. Comments, suggestions and criticisms welcome! Here's the original 4554 as reference.